Lift & Accessibility Solutions has chosen Elcoma Grab Bars to install in their client’s homes because of their reliability and durability. Whether the finish choice be stainless steel, brass, or painted, every Elcoma bar is beautifully crafted and designed to meet our customers standards. Elcoma provides a large selection of styles, finishes and configurations. 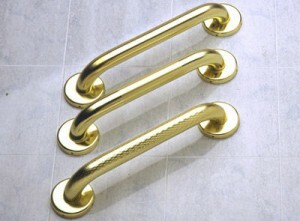 What sets these grab bars apart is that years later, the finishes are still beautiful. 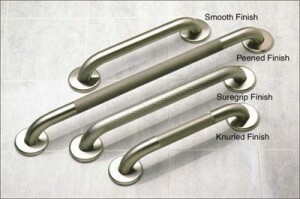 Lift & Accessibility Solutions stocks the 1-1/4″ Stainless Steel Knurled Grab Bar with Concealed Flanges in various lengths. 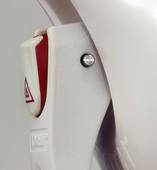 We also carry the Wing-its and Solid Fiberglass Mounts for installation where there is no backing available. 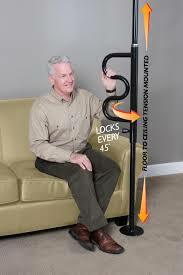 Our technicians are trained to install these bars where you need it. Elcoma utilizes the most modern techniques in the design and manufacture of their products. Their commitment to maintain the highest standards of quality control enables their products to exceed the standards set by federal, state, provincial, or local codes. HealthCraft developed its products based on direct feedback from thousands of patients, caregivers and dealers who use or work with home medical equipment. The company designs and manufactures home medical equipment that enables the physically challenged and elderly to live independently in their homes. The company’s first product was the Super Pole System – a patented modular support system which provides standing and transferring assistance to the elderly and physically challenged. Lift & Accessibility Solutions has been installing these very dependable and versatile support bars throughout Northern California for years. There are many to choose from and we are here to help you know which ones are best for your situation. Contact us by phone or email, and let us help you decide. The Invisia collection is designed with a spa in mind. 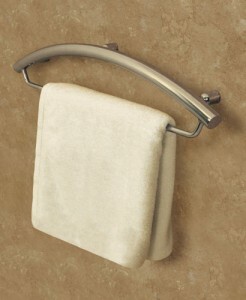 It’s elegantly designed grab bars help to transform your bathroom into a relaxing sanctuary. 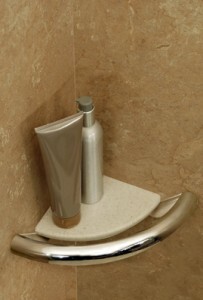 Invisia offers luxurious bathroom accessories that also happen to be grab bars hidden in plain sight! 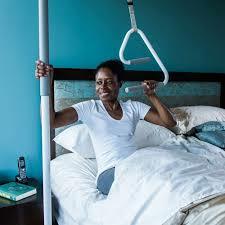 Mobeli portable grab bars provide assistance anywhere in your home or while traveling. The strong suction adheres to most smooth surfaces. Because the Hand-Grip portable grab bars are not screwed into the surface, they are perfect for renters, traveling or visiting. 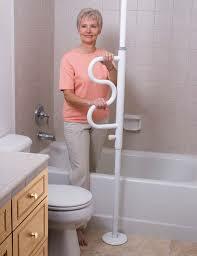 You can easily attach a Mobeli grab bar to marble, glass, tile, or any surface that may be damaged by drilling holes. An innovative safety feature unique to the Mobeli is the safety indicator on each bar. 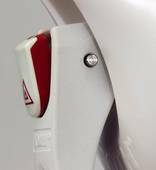 When the rocker is flat to the lever, the suction is adequate for the load, when the warning rocker rises and the red edge shows, then release and reattach the suction pad. The rocker can be both seen and felt for the site impaired. 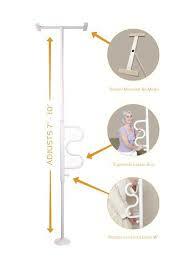 Mobeli portable grab bars consists of two or more suction cups with release levers on the grab bar. The suction housing and bar are high tensile plastic components, suction pads are natural rubber and all metal parts are stainless steel. Parts are easily disassembled, lightweight and take little space for travelers. Due to the vacuum suction generated by the discs, the grab bar can only be attached to smooth and non-porous surfaces, which are pore – and steam-tight, dry and free of oils and grease. On rough or porous surfaces, the vacuum hold diminishes or does not exist at all. All tiles are not necessarily smooth and steam-tight, test your surface first. 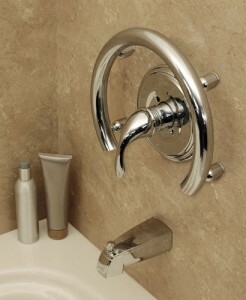 Using the grab bar under water or in extreme temperatures (such as a sauna) reduces the suction power. The minimum area for each suction cup for adhesion is 5”x’5”. 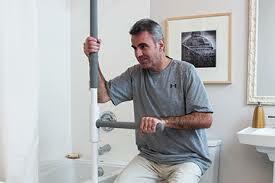 The use of Handi-Grip portable grab bar is not recommended on dry wall. 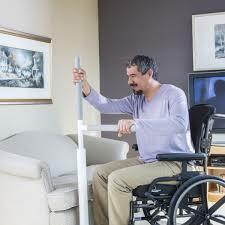 The Stander Security Pole and Curve Grab Bar is a tension mounted pole that enables a person to easily stand from bed, toilet or couch. 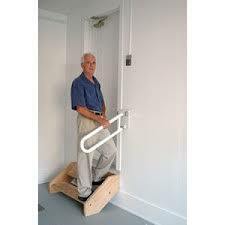 It can be placed anywhere in the home without screws or bolts. To make it easier to climb to a standing position the Curve Grab Bar has 4 handgrips that rotate 360 degrees so it can be moved into the position that is needed. It comes in black or white. The Stander Security Pole and Curve Grab Bar installs easily, adjusts to 7-10 foot ceilings and carries a lifetime warranty! 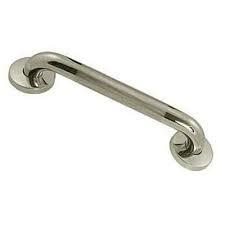 It is made of rust resistant zinc plated steel with durable power coat finish. Weight capacity of 300 pounds.